Hello! I spent the majority of the evening covered in pumpkin guts, but I still managed to make this card too. 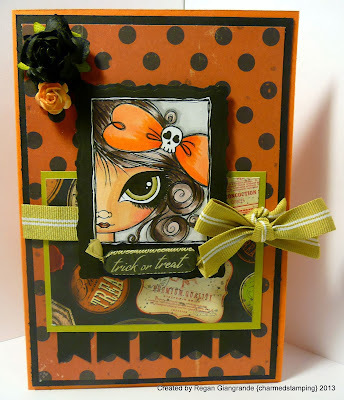 I've used one of the images I won from Dilly Beans Stamps recently to make a Halloween card for an awesome friend of mine! She really loves their images and I thought this big eyed girl was perfect! The image is called Skull Bow Framed and I've colored her with Copics. 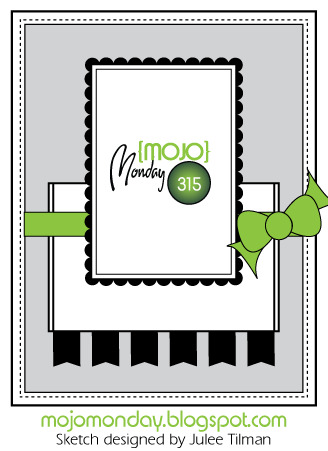 The sketch is from Mojo Monday (#315). 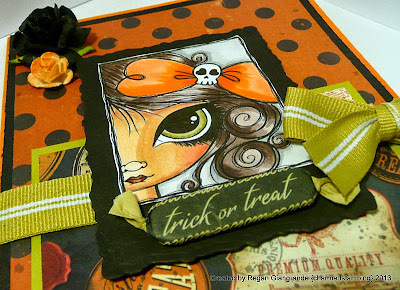 Papers are K&Company (Brenda Walton's Haunted) from my stash. I used a Small Deckled Rectangle Nestabilities from Spellbinders to mat the image and my Fishtail Flags Stax Die-namic from My Favorite Things for the pennant detail. The only embellishments I added were a couple of flowers and a Martha Stewart "candy" sticker. The rest of my night was spent carving up our pumpkins and making pumpkin seeds. It was the first time I have ever carved a jack o'lantern completely on my own- or well, at all actually! I usually just watch all the mess and the hard work and then lounge around eating pumpkin seeds after! But this year, I ventured out of my comfort zone. They are no masterpieces by any stretch of the imagination, but Kayne said they were wonderful and that's all that matters! He doesn't need to know that I broke one of the mini saws the carving kit came with. Or that I messed up the one-eyed monsters teeth (He's missing one! Ooops!) I tried and that's what counts. We will be dropping these off for a pumpkin display that we will be attending this weekend. I am exhausted and really need to get some sleep! 'Night! Markers used: Copics (E00, E11, E13, E15, E19, E21, E70, E74, E79, R32, YG911, YG93, YG95, N0, N2, N4, N6, N8, YR00, YR02, YR04, YR07). Oh I really love, love, LOVE this - your coloring is awesome. And your jack-o-lanterns rock. You are da bomb. :) Thanks for joining us at Dilly Beans, my friend! This is a darling card. I love it, love your design and love your image. Beautiful card. Your coloring is amazing. Wow what a fabulous card, I have that image and would never have thought to design it like you have. We learn something new every day. Great take on the sketch. thanks for playing along with us at Clear it Out Tuesday for the Halloween challenge. Awesome Card. Love backed pumpkin seeds they are the BEST! Love this card Regan! Gorgeous!! !